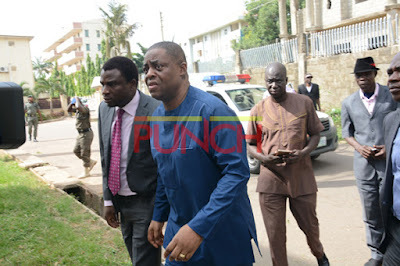 A former Minister of Aviation Femi Fani-Kayode slumped in the custody of the Economic and Financial Crimes Commission on Saturday, his spokesperson, Jude Ndukwe, has said. Ndukwe said in the statement on Monday that Fani-Kayode’s family and his lawyers had raised concerns about his health when he was re-arrested by the anti-graft agency on Friday, but their concerns were ignored. The statment read in part, “We made known our fears that Fani-Kayode’s life was in dire danger as long as he remained in EFCC custody or in the custody of any agency of the federal government based on discreet information available to us. “This is apart from the fact that his health has been badly affected since his incarceration for a whopping 67 days based on some questionable ‘detention orders’. Ndukwe said contrary to the expectation that the letters from the former aviation minister’s lawyers about his medical condition and that he had yet to complete his “therapy” following his earlier detention, the EFCC refused to release. “It is therefore little wonder that based on the history of his medical condition which the Commission is very much aware of, Chief Femi Fani-Kayode slumped while in detention on Saturday, 22nd of October, 2016,” he said. He called on the EFCC to release Fani-Kayode pending his arraignment for the charges against him, warning that there would be consequences should anything happen to him.